It’s a fresh and rococo Thursday evening in Toronto before Canada daylong weekend and the festivities are planned to begin! The girls and I are invited to an exclusive “Blanche” party at Maison Mercer on the rooftop patio by the legendary Philip Princeton. I am ready to welcome the summer season with open (sleeveless) arms because this means outdoor parties are upon us!!! There are plenty of alfresco parties in Toronto to be had and how appropriate to attend my first of the season in all WHITE. When a dress code is in effect I naturally question the significance. I learned that white is the color of purity; it stands for wholeness and completion, openness and truth, providing clarity. It is a good color choice for new beginnings and development in any direction. Hmmmm, does it armor me from the effects of Tequila? Perfect themed party to kick start my summer! I’m convinced this night is going to be epic! If you don’t want to spend a pretty penny for your sinequan, just buy it right now for 0.38 USD only! And after all the weather was ideal. They could not have had a more perfect seductive summer night for a garden-party if they had ordered it. Windless, warm, the sky without a cloud. Floating through the crowd I could not help but feel like I was in the heavens, mingling among archangels, some faces familiar, some I haven’t seen in years and some quickly became new acquaintances. Soft whispers, clanging glasses and warm echoes of laughter filled the air while groovy tunes played in the background. Maison Mercer located in the heart of the entertainment district represents the passion of the avant-garde and embraces the new and the unknown. To a novice, this may only look like another nightclub… but stand back and watch. The “Blanche” crowd begins to trickle in which has become the Mecca of good-looking people. Bold, Beautiful and Classy all ready to have a good time. Right from the moment you walk up to the patio, you quickly realize the unique and individual personality of the space. Open rafters and hanging white sheaths complemented by lit candles and lanterns fuel the energy and warmth among the crowds. Naturally and immediately you are drawn to the long bar decorated with beautiful and friendly staff. I ordered a crisp glass of Chardonnay, and it is around this time I also notice the strategically placed plantings of flowers. This attention to detail is something one has begun to expect fro the Capture Group. Your evening experience begins with plenty of space to casually enjoy your surroundings of our beautiful city Toronto. The stars and power of the skyline provides both an escape and reminder of opportunity to meet and connect with some of Toronto’s finest. Something about everyone wearing while makes them approachable, chill and relaxed open to engage in all types conversation. When I spoke to Mr. Philip Princeton the next day he described the evening as “Transcending into a moment that you never want to leave” I agree….best describing that moment as the PRESENT. I look forward to the next soiree hosting by this gentleman! 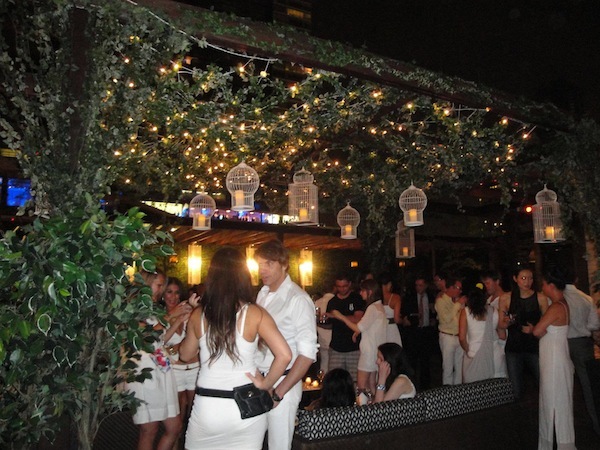 I suggest you all check out the oasis in the middle of the city roof top patio Maison Mercer! Take a break from the everyday….enjoy a carefree summery atmosphere!